?STYLISH SCHOOL UNIFORM - The ruffles give the uniform dress some character without being too fussy, it would look good on any girls. ?BUTTON FRONT DESIGN - Functional buttons make the dress can be cardigan dress or normal dress, can be dressed up or casual. ?SUPER COZY MATERIAL - The sweater dress made of 62% cotton, 28% polyester, 10% spandex. Soft and Cozy. Stitching is well done on all edges. ?KNIT LONG SLEEVE - Long sleeve cuff are rib-knit style, elastic fitted and durable, makes it cuter in person. Great for fall and winter. 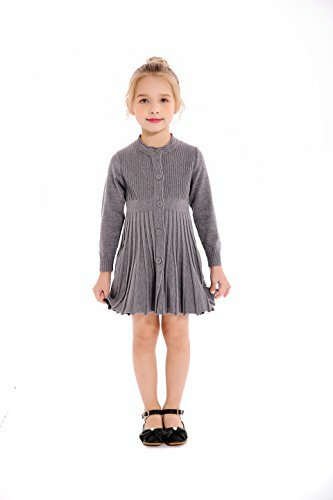 ?FOR ANY OCCASION - The basic pleated dress looks simply beautiful, perfect for school, holiday, party, daily wear and any occasion.